Improper pilot decisions cause a significant percentage of all accidents and the majority of fatal accidents in light single- and twin-engine aircraft. The goal of SBT is to challenge the student or transitioning pilot with a variety of flight scenarios to improve decision-making skills. These scenarios require the pilot to manage the resources available in the flight deck, exercise sound judgment, and make timely decisions. As defined in The Teaching Process, SBT is a training method that uses a highly structured script of real world experiences to address aviation training objectives in an operational environment. Such training can include initial training, transition training, upgrade training, recurrent training, and special training. Since humans develop cognitive skills through active interaction with the world, an effective aviation instructor uses the maneuver- or procedure-based approach of the PTS but presents the objectives in a scenario situation. Although some CFIs have used the SBT approach as a teaching method for many years, the recent emphasis on SBT in aviation training reflects education research that shows students learn more effectively when actively involved in the learning process. The introduction of advanced avionics is also a factor. Advanced avionics have changed the role of general aviation (GA) from an industry dominated by pleasure flying to a viable alternative to the scheduled airlines. With glass displays, GPS, and autopilot, advanced avionics may allow easier and safer operation, but are more complex. Advanced avionics have contributed to a shift in the focus of aviation training to include aeronautical decision-making (ADM) and risk management. For the pilot, this is called Single-Pilot Resource Management (SRM). Since SRM training requires the student or transitioning pilot to practice the decision-making process in real-world situations, it combines traditional task and maneuver-based training with SBT to enhance ADM, risk management, and SRM skills without compromising basic stick and rudder skills. Instead of training pilots to pass practical tests, this program focuses on expertly managed real-world challenges. 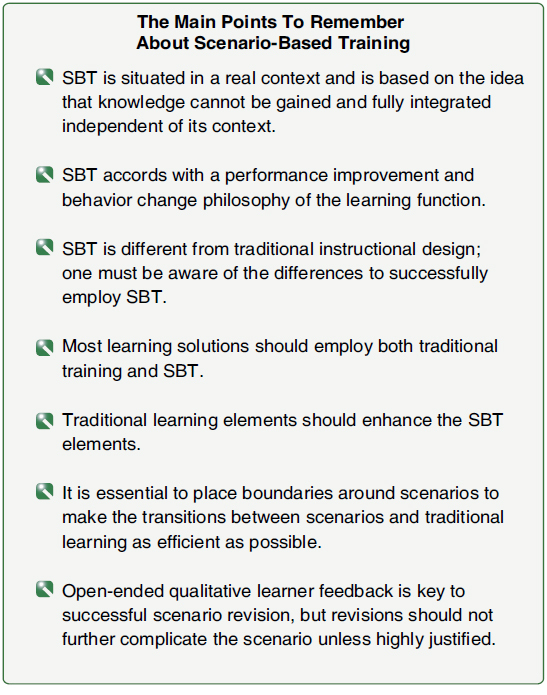 Orient new learners to the SBT approach. Help the learner become a confident planner and a critical evaluator of his or her own performance. Help the learner understand the knowledge requirements present in real world applications. Diagnose learning difficulties and help the individual overcome them. Evaluate student progress and maintain appropriate records. Provide continuous review of student learning. The aviation instructor is the key to the success of SBT. Remember, the overall learning objective is for the student to be ready to exercise sound judgment and make good decisions. For example, the flight instructor must be ready to turn the responsibility for planning and execution of the flight over to the student as soon as possible. The flight instructor continues to demonstrate and instruct skill maneuvers in the traditional manner; but, when the student begins to make decisions, the flight instructor should revert to the role of mentor and/or learning facilitator. A situation a student faces may not have one right or one wrong answer. Instead, a student encounters situations in training that may have several “good” outcomes and few “poor” ones. Rather than requiring the student to make a decision that matches the instructor’s personal preference, he or she should understand in advance which outcomes are positive and/or negative and give the student the freedom to make both good and poor decisions. This does not mean that the student should be allowed to make an unsafe decision or commit an unsafe act. However, it does allow the student to make decisions that fit his or her experience level and result in positive outcomes. The SBT lesson plan differs from the traditional lesson plan. [Figure 6-8] In this example, the instructor pilot tells the student to plan for arrival at a specific nontowered airport. The planning should take into consideration the possible wind conditions, arrival paths, airport information and communication procedures, available runways, recommended traffic patterns, courses of action, and preparation for unexpected situations. Upon arrival at the airport, the student makes decisions (with guidance and feedback, as necessary) to safely enter and fly the traffic pattern. This is followed by a discussion of what was done, why it was done, the consequences, other possible courses of action, and how it applies to other airports. In contrast to the student who trained under the traditional lesson plan, the student who trains under the SBT format is not only capable of a specific flight maneuver, he or she is now capable of detailing the safe arrival at any nontowered airport in any wind condition. Figure 6-8. SBT lesson plan. The aviation industry is moving from traditional knowledge-related learning outcomes to an emphasis on increased internalized learning in which learners assess situations and react appropriately. Knowledge components are becoming an important side effect of a dynamic learning experience. Reality is the ultimate learning situation and SBT attempts to get as close as possible to this ideal. It addresses learning that occurs in a context or situation. It is based on the concept of situated cognition, which is the idea that knowledge cannot be known and fully understood independent of its context. In other words, humans learn better, the more realistic the situation is and the more they are counted on to perform. For example, realistic cross-country flight scenarios planned and executed by the pilot in training with assistance from the flight instructor begin the early development of flight deck management skills, situational awareness, and ADM. Continued engagement by the student in the planning, executing, and assessment of each scenario reinforces it throughout the training. It is important to remember the student is responsible for planning the flight scenario from a menu of short cross-country flights developed by the training provider. While the flight instructor will certainly assist the student in aircraft performance data, weight and balance, and general aircraft layout prior to the first lesson, the sooner the student assumes these responsibilities, the better the learning environment. The scenario descriptions offered in the FAA generic syllabi are a starting point for the training provider. Scenarios can be tailored for the local weather and terrain conditions and are most effective when they replicate the environment most likely encountered by the students. SBT is a compilation of basic learning theory, adult learning concepts, and the best of the traditional aviation training procedures. Above all, it is about learning complex tasks in a realistic environment at a pace and in a structure the individual student can comprehend and process. [Figure 6-9] Good teaching techniques are still important, but only if they aid in student learning. Figure 6-9. Points to remember about scenario-based training. SRM is the art and science of managing all the resources (both on-board the aircraft and from outside sources) available to a single pilot (prior and during flight) to ensure that the successful outcome of the flight is never in doubt. 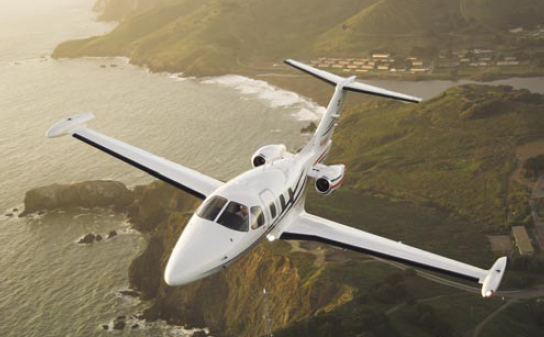 The emergence of very light jet (VLJ) aircraft will revolutionize the way America travels. [Figure 6-10] Central to their economic success is the concept of single-pilot operations. Since the aircraft is heavily automated, the pilot’s workload may actually be less than the current workload in a high performance single-engine aircraft of today. This allows more time for the pilot to gather and analyze information about weather, winds, landing conditions, fuel state, pilot physical condition, and passenger desires. Figure 6-10. Very light jet aircraft in flight. However, unless the pilot is trained to manage all of these factors and to let the aircraft automation assist, the workload may be very high. SRM training helps the pilot maintain situational awareness by managing the automation and associated aircraft control and navigation tasks. This enables the pilot to accurately assess, manage risk, and make accurate and timely decisions. SBT enhances SRM because SBT helps pilots learn how to gather information, analyze it, and make decisions.